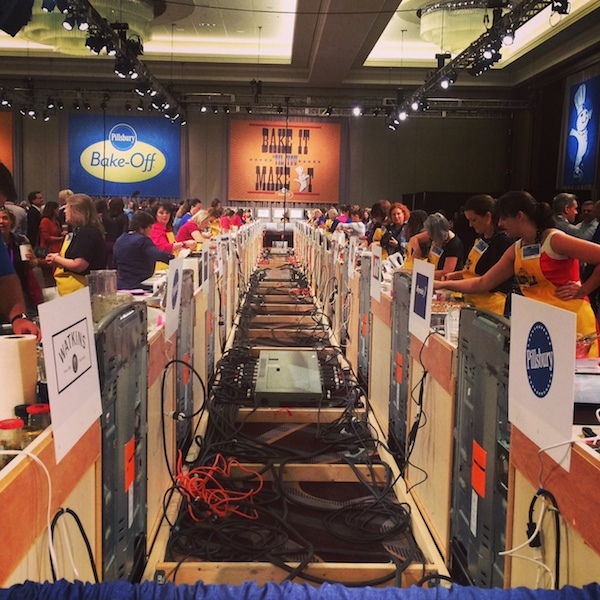 Talk about an ENERGY boost… I was in Nashville, Tennessee last week to cover the Pillsbury Bake-Off. Lots of people assumed I was competing for the grand prize of One Million dollars, let me clarify right off the top I was not there baking, nor did I submit a recipe, I was there to cover the event for Que Rica Vida (General Mills- Latin division). I had always heard about the bake-off and have even caught a glimpse of it on T.V. 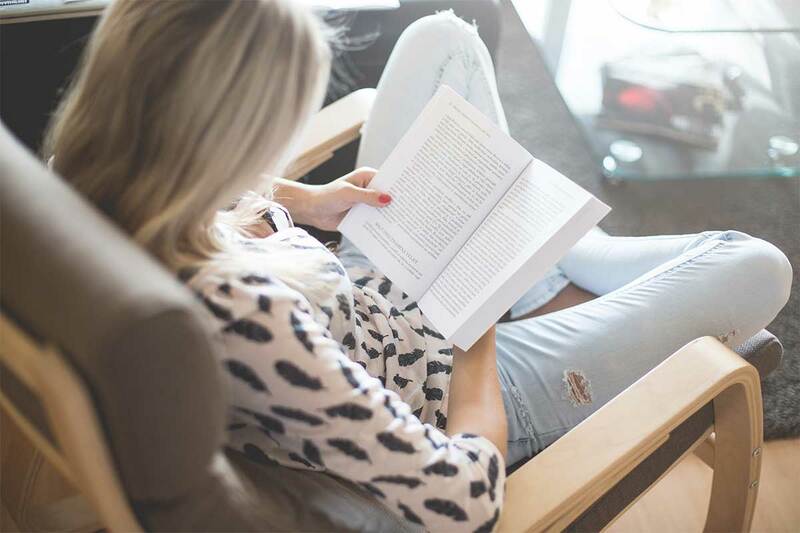 , but to actually be there and feel the energy of the room and the tension of the competitive bakers was a completely different experience then I had imagined. A lot of contestants have been submitting recipes for years and were there for the first time, and others are professional contest recipe applicants. This is a serious business for some especially when there is a million dollars at stake. It was interesting to watch and even more enticing to sample some of the finalist recipes. At the end of the four hour bake-off a panel of judges chose 4 finalist who are all vying for the grand prize. The announcement will be made on ABC’s The Chew Dec. 3rd. Do you want to help pick a winner? Vote here! 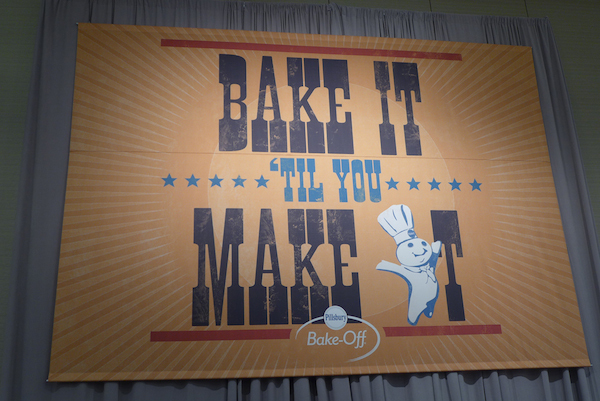 I left the bake-off so inspired by what I saw… it made me think what would I make with Pillsbury if I was in the competition. 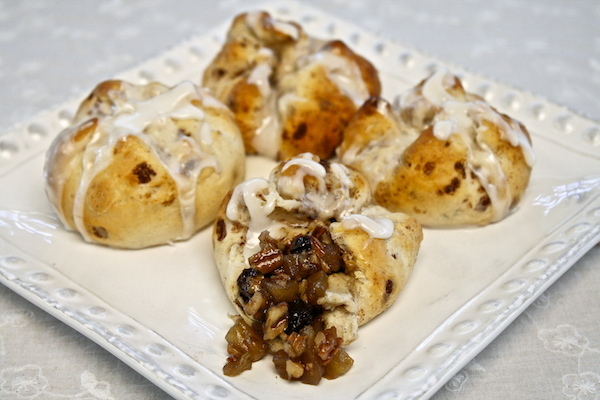 I would definitely enter under the breakfast category with these apple raisin cinnamon knots topped with a Eagle brand sweetened condensed milk glaze. In a small sauce pan over a medium flame add in butter and allow to melt. Once melted add in piloncillo. Let piloncillo dissolve, then add in apples and stir to coat all the apples in the sugar syrup. Sprinkle with cinnamon, and continue cooking for 10 minutes. Add in raisins and mix them into the apples. Cook for an additional 5 minutes allowing the raisins to plump up. Remove from flame and mix in the pecans. Set to the side. Line a cookie sheet with a baking mat or wax paper and set to the side. Open Pillsburry cinnamon rolls and remove icing. Separate each cinnamon roll. Working with one at a time, get a cinnamon roll and flatten it out into a flat circle with either your hands or a rolling pin. 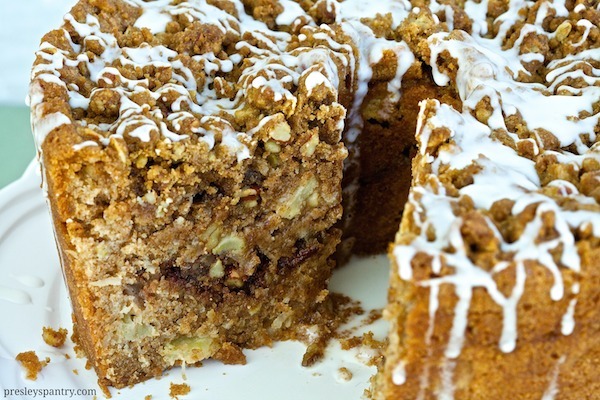 Fill the center of the dough with 1 teaspoon of the apple raisin filling, then gather all edges of the dough to the top and pinch them together and twist. Creating a dumpling- like ball. Place on the cookie lined sheet and continue till done. Remove from oven and drop a dollop of Eagle brand sweetened condensed milk in the center of each cinnamon roll bite. It will melt a little and spread down the sides. 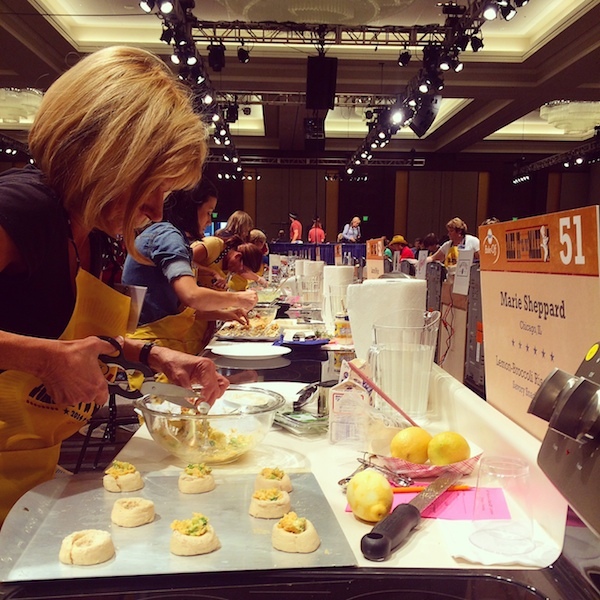 Disclosure: I was invited by Pillsbury to attend the Pillsbury Bake-off. All opinions are 100% my own. 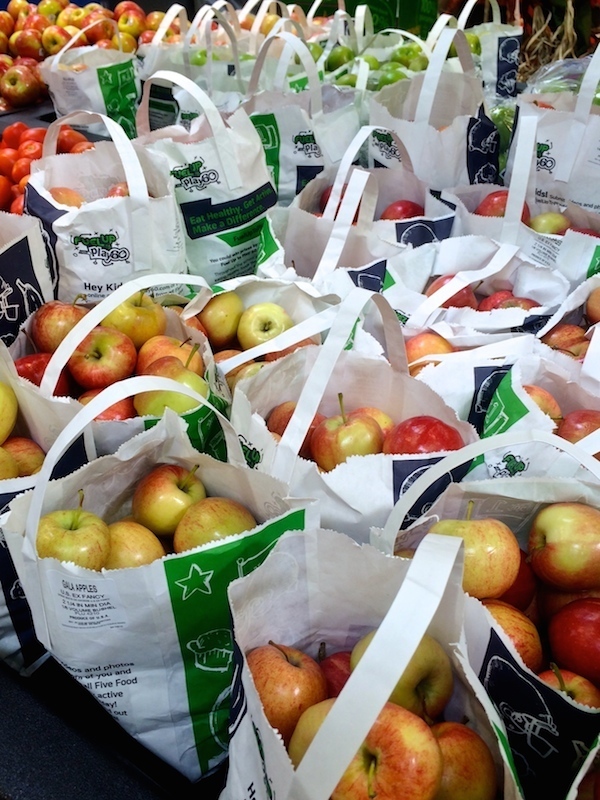 Fall apples: I picture the shiny apples of fairy tales, a long wind ruffling through the tree branches, crunchy leaves that break under my feet, and crisp clear night skies touched with notes of frosty bites that sting the skin. That’s my version of Fall as it weaves in and out of my memory. I devote my hours housed in my baking kitchen atop a generous heap of various types of apples. I buy every color I can find at Walmart. The tempting fruit spheres come in hues of the season: yellow, green, and red. Take your pick, my fine pretty, as they are super affordable. What I make depends on my mood. Once upon a time it could be a lovely apple tea, or happily ever after applesauce. If the witch’s broom touches down on the ground she might be in search for a candied apple. Perhaps if I bake an apple crisp I will attract every mouse, bear and rabbit to wait at my back door till I serve them each a scoop. I could make mountainous apple fritters that will serve as hiding places for the tiny sprites that live among the pines. 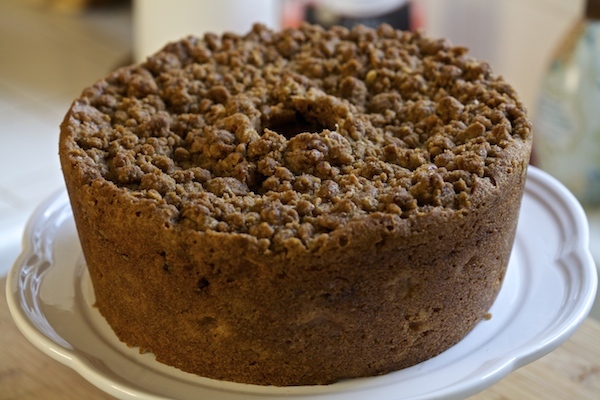 Or maybe I should feed the little girl inside of me that is always chanting “apple coffee cake, apple coffee cake, apple coffee cake….” How could I ignore those precious wishes? 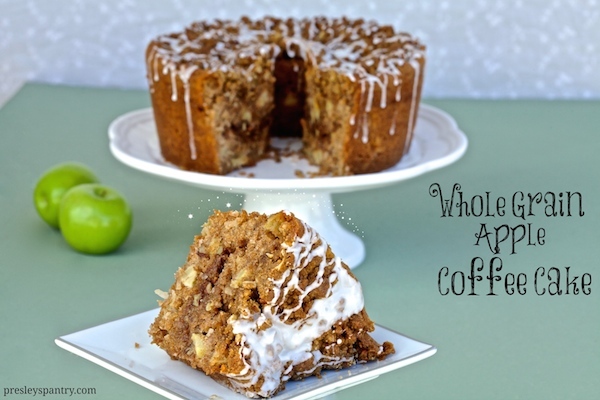 I take whole grain flour and mix it with apples and other sweets for the most amazing tasty wholesome cake that just might wake me from my dream, because surely this is the cake of my dreams. Now just to figure out how to get the cake out of that darn tube pan. Spray a tube pan with a non-stick baking spray. Set to the side. 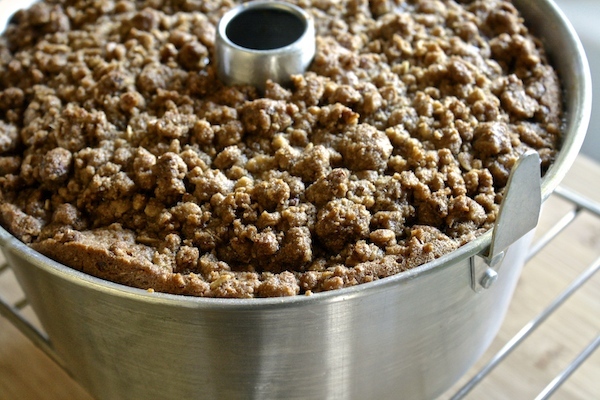 For the topping: In a bowl combine brown sugar, pecans, oats, whole wheat flour, cinnamon, and salt. Mix with a fork to combine. Then using your fingers mash cold butter into dry mixture until it forms into little crumbs the size of peas. Place in the fridge until ready to use. 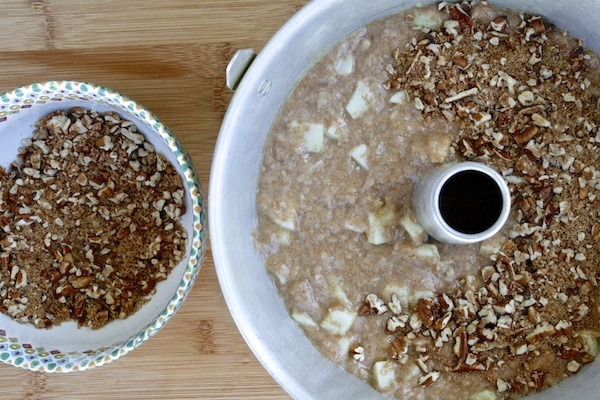 For the center: In a bowl mix brown sugar, pecan and cinnamon together. Set to the side until ready to use. For the cake: In a mixer add in sugar, eggs, vanilla extract, vegetable oil, and orange juice. Mix to combine completely. In a bowl sift whole wheat flour, baking soda, cinnamon, salt and ground ginger together. Slowly add dry mixture to wet ingredients until combined. 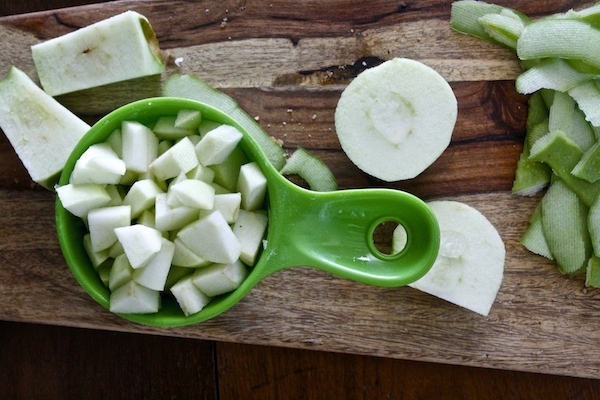 Add in apples and coconut. Mix until completely combined. Pour half of cake batter into greased tube pan. Sprinkle center mixture into top of batter. Top center mixture with remaining batter. Smooth the top of batter with a spatula, then top cake batter with topping reserved from the fridge. Bake cake for an hour and a forty minutes. Remove from oven and let cool on cooling rack until completely cooled. I like to let it cool over night. Remove cake from tube pan (see video below on how to remove cake from tube pan) and place on a cake stand. 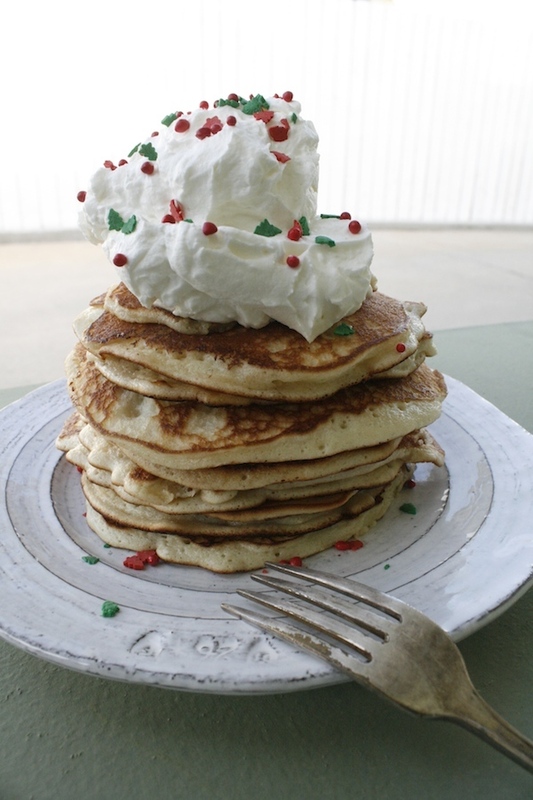 For the icing: Whisk powdered sugar and crema Mexicana together. Drizzle over the top of the cake and let stand for 10 minutes before slicing. 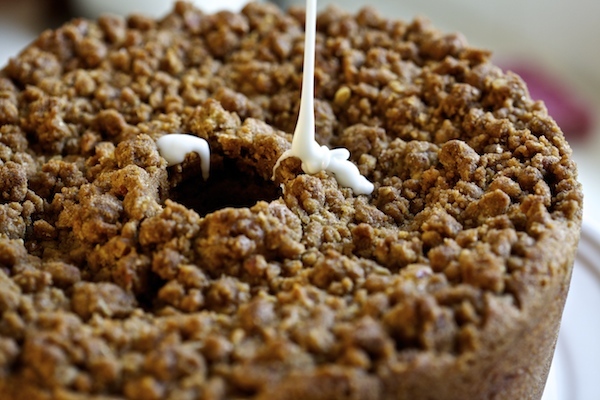 Watch this quick video on how to remove cake from tube pan! 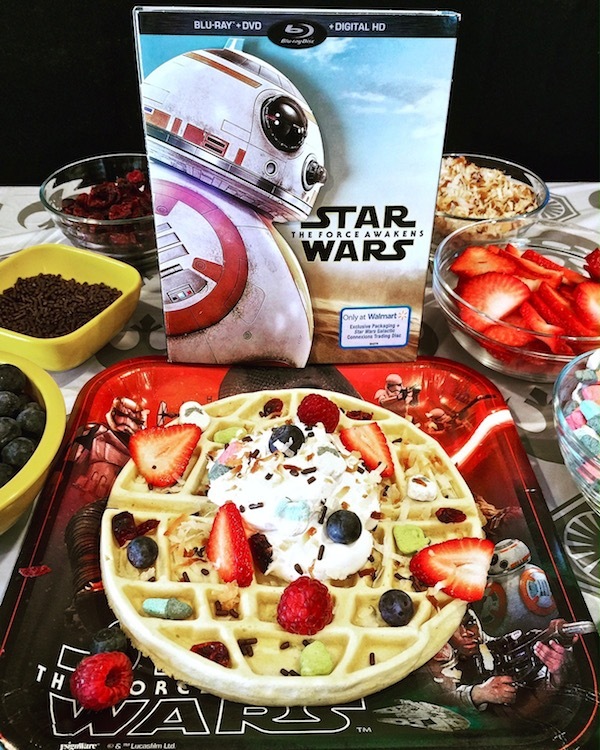 My son is at school for a good portion of the day, and my main concern is – Is he eating? I know he might take a bite here and there, but I can’t be sure he’s gonna eat his lunch everyday. He just turned five, and sometimes eatting isn’t at the top of his list when he knows he can be playing with his friends. I take matters into my own hands, and always make sure to fuel him up in the a.m. before he heads to school. 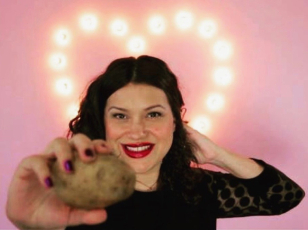 A few months back I was in Bentonville at the Walmart headquarters where we (the Walmart Moms) learned all these great ways to get our kids eating. 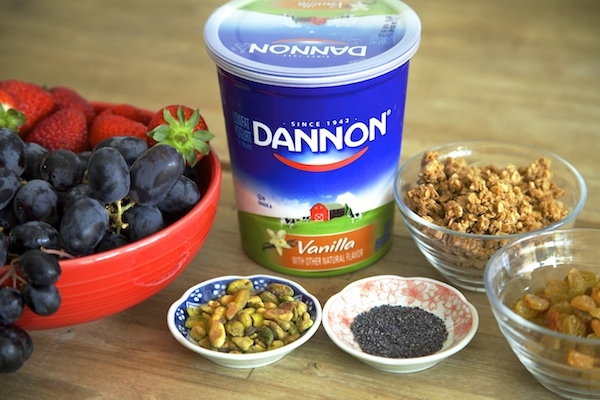 The nice people from Dannon and Kelloggs made a few yogurt/breakfast treats that were kid and adult friendly. I jotted down mental notes, and called them from my memory bank now that my boy is in school. Last week while I was in the refrigerator section of Walmart, I came across the yogurt selection. I remembered these incredible dippers they had made out of yogurt, where you dipped a piece of fruit in the yogurt then dipped in a crisp cereal. Light bulb went on, and I grabbed a tub of vanilla yogurt. 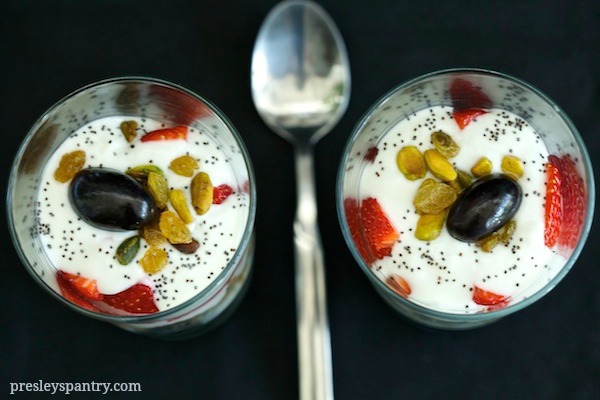 I came home, made a few dippers to snack on and then made a few cups of parfait filled with fruit, granola, pistachios, and a few sprinkles of poppy seeds for the following morning. 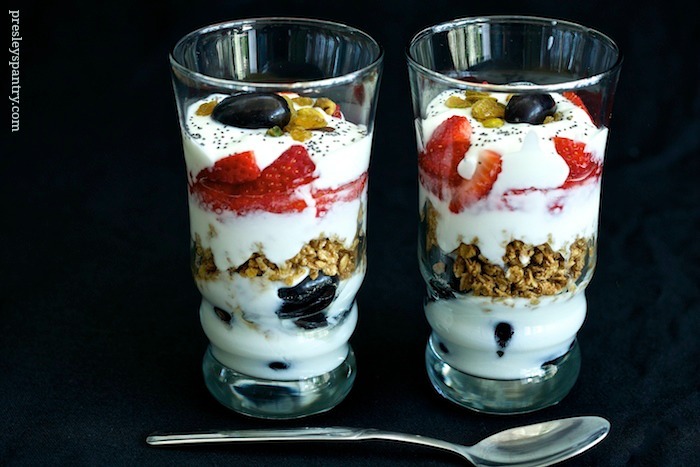 I just felt the parfait was something the whole family could eat together at the table in the morning before we each step out to meet our busy days. I was so pleased when everyone dug in and asked why we don’t eat this tasty breakfast more often. Now I know how to get breakfast on the table at a lightning speed and still have time for a little bonding. In a tall glass or jar drop a few black grapes on the bottom of cup. 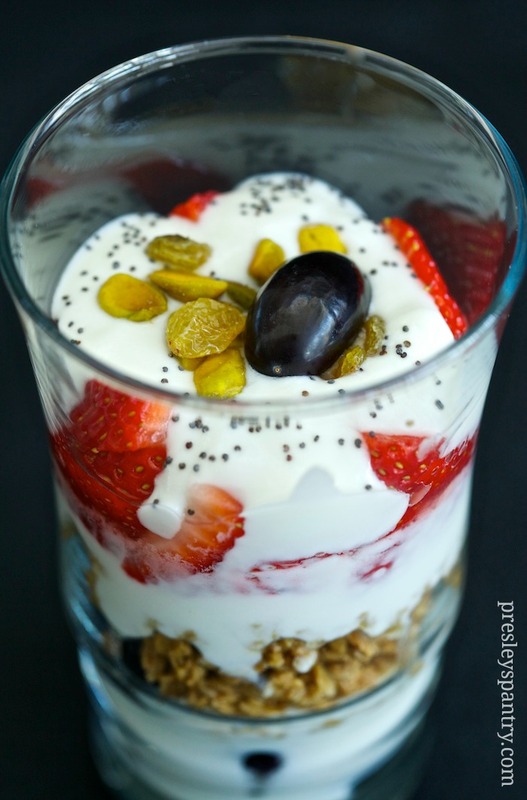 Top with 2 tablespoons of yogurt. Sprinkle in a pinch of poppy seeds, raisins and pistachios. Top with a black grape. 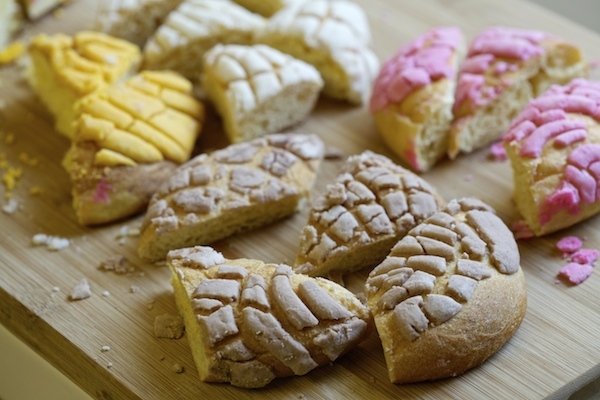 When I was a little girl my grandfather would come home Friday afternoon from a long week of working hard with a brown bag filled with pan dulce. He would place the sweet bread in a dish on the table in preparation for his weekend routine. I always knew on Saturday morning as I heard the clink of his spoon stirring his ceramic cup that he was enjoying a cup of coffee with a little bit of abuelita chocolate grated in and an entire piece of pan dulce. He would set out a small jar of dulce de leche for me to have as a spread on my pan dulce in the event that I may have wanted to be extra sweet that morning. 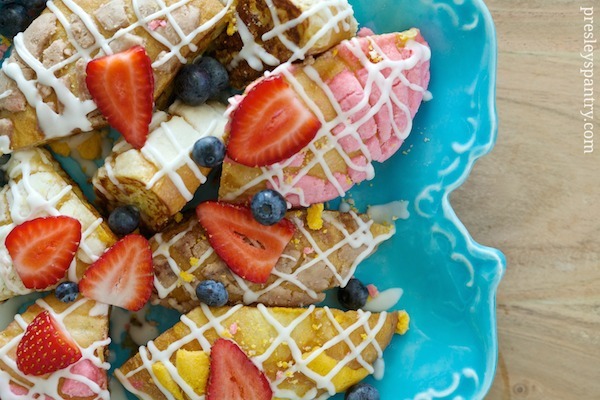 Once Sunday morning would roll around the pan dulce would be hard and perfect for a french toast breakfast. I would rise early and watch my grandfather as he dipped the two day old stale bread into a creamy bath of eggs, milk and cinnamon. He would then butter a pan and cook the wedges into Mexican French Toast perfection. He would then place it on a communal platter and drizzle the top with dulce de leche and berries. I would take a plate and so would he, and as I became older I would join him in washing it all down with a warm cup of coffee. This was our ritual, our bonding time, our time to catch up while the rest of the house still found peace in their dreams. He would share stories of his childhood living in between Juarez, Mexico and El Paso, Texas and how rough it was for him, his single mom, and all his siblings living through the depression. Some of the stories were so unreal and sad that all I could do was be thankful that he made his way via a freight train to Los Angeles to build a life here, and make the best of his situation. His stories play out like a beautiful mariachi ballad drenched in tears and boisterous laughter. He is my hero. Recently I was at a tasting and the Mexican chef made french toast out of pan dulce. It immediately took me back to the days of living under the same roof as my grandfather and enjoying Sunday breakfast with him drenched in our latin history. I decided to recreate the dish with my own spin to it. As I was shopping for the ingredients I went to grab some coffee-mate for the cafesito, and noticed they now made Dulce De Leche flavor and Abuelita chocolate flavor, yes you read right. Can you believe that deliciousness? I grabbed two of each, one for him and one for me. This past Sunday I invited him over for a pan dulce french toast breakfast and stories of our Hispanic heritage and waited to hear the clink of the spoon against the ceramic mug. On a large cutting board slice pan dulce into wedges. Set to the side. In a bowl whisk eggs, milk, cinnamon, and vanilla extract together. 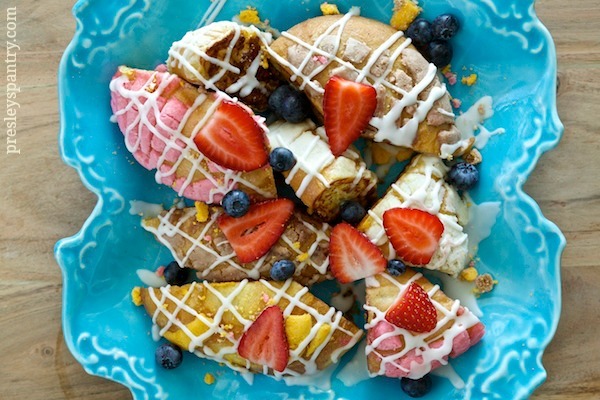 Lightly dip pan dulce wedge into egg batter. In a pan over a medium flame add a small amount of butter to grease pan. 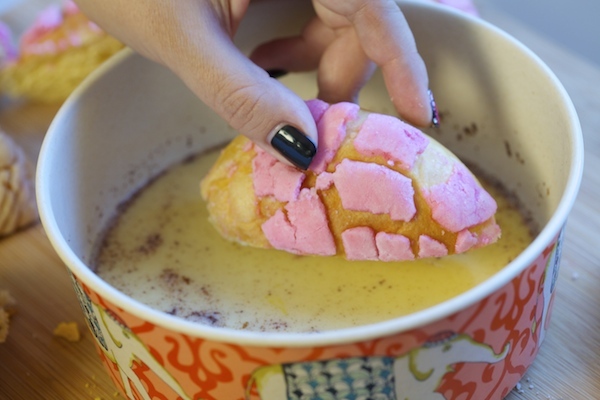 Once melted, add in soaked pan dulce wedge. 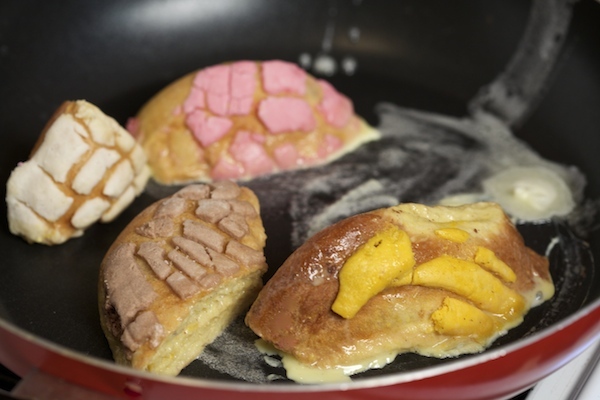 Fry pan dulce in butter on all side until fully cooked about two to three minutes per side. Place on a large plate. 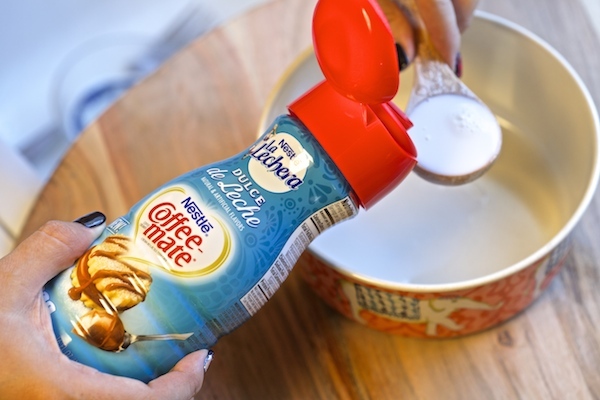 In a small bowl whisk coffee-mate dulce de leche and powdered sugar, until there are no clumps. Place dulce de leche mixture in a small plastic bag and cut a small snip in the end. 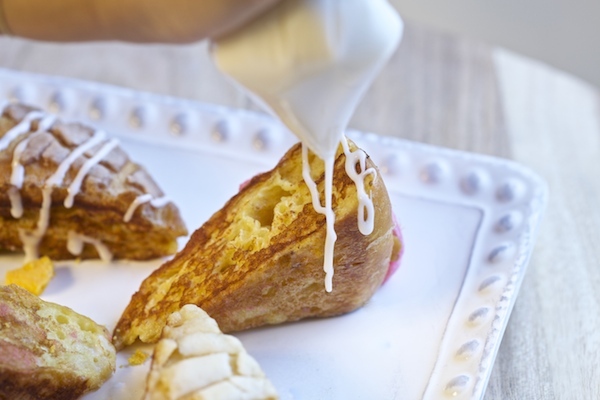 Drizzle over the french toast. 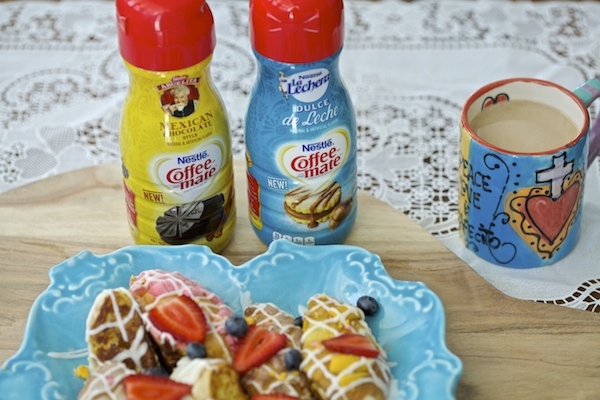 Serve with a cup of coffee and Coffee-Mate abuelita flavor. WAIT…. There’s more! I am giving away a Coffee-Mate kit! The giveaway consists of 1 hand designed coffee mug (by my buddy Crafty Chica), two coupon vouchers, a set of coffee coasters, and a coffee sleeve (pictured below). Enter for a chance to win! 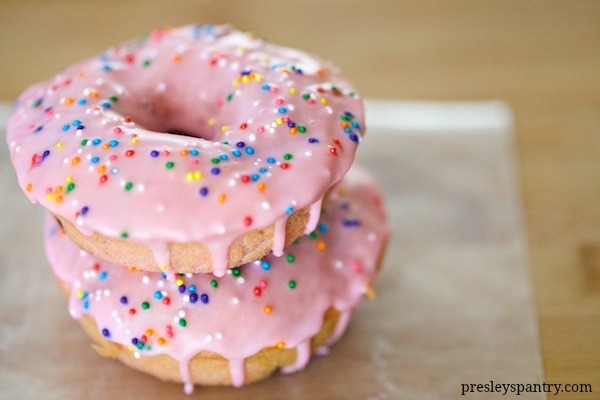 Where there’s pink frosting, there’s gotta be donuts. I recently celebrated by son’s birthday in a big way with over 135 guests. There were lots of treats and it was a very boy driven day. I don’t think there was anything pink in sight for miles. As I stood there observing the kids at the party I realized we had a lot of little girls running around too. I watched them running with long hair and cute braids, some even had glitter in their hair. It made me miss celebrating my own girly side, and I made a small mental note when the chaos of life dies down a little I would take some time to be ultra girly again. Yesterday I was organizing my pantry and came across some decorative colored candy sprinkles, you know the type you see on either Mexican or Italian cookies. I purchased them a while back and still hadn’t done anything with them. That instant was the perfect time to be girly. I fancied myself eating a pink donut topped with candy sprinkles. Now to get from point A to B was going to be a bit challenging. I started thinking of everything pink. I looked in the fridge and found some fresh cherries (strawberries or blueberries would have worked fine as well), then found a box of pink cake mix flour in my pantry too. It was all coming together. I wanted my pink donuts to be a little more dense than cakey, so I thought “Hmmmm, I bet if I add Maseca to this pink party, that will definitely do the trick!” And it did. 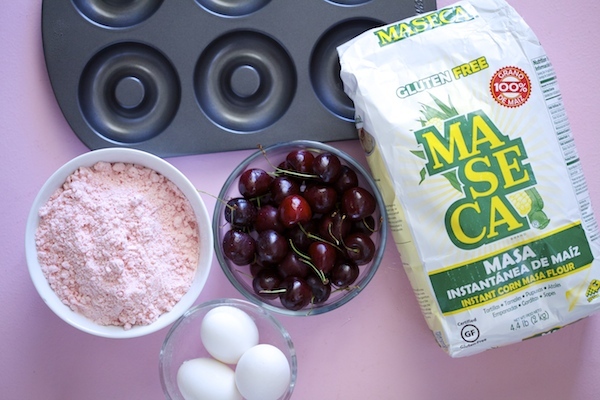 Thanks to my wonderful versatile Maseca corn flour, I had pink donuts all day long, and it felt grand to be a girl. 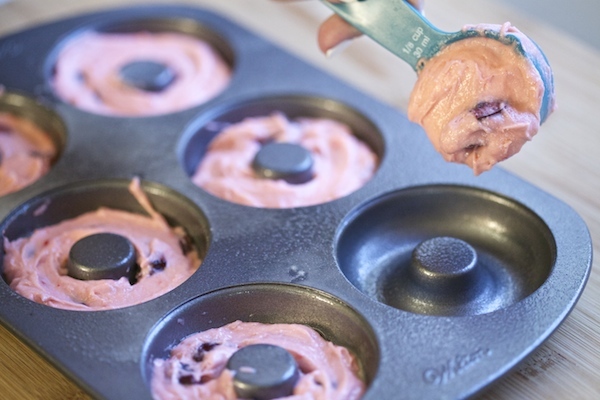 Spray a donut pan with a non-stick spray. Set to the side. 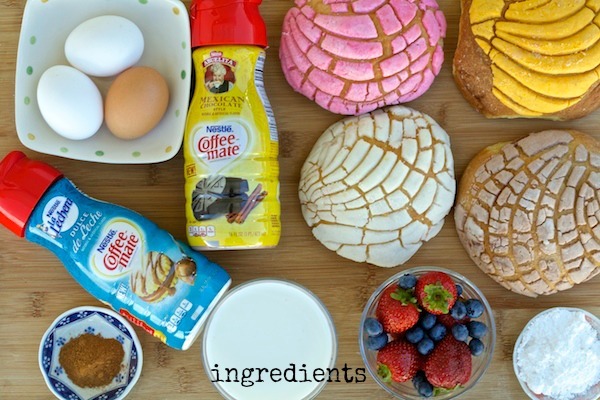 In a mixer add eggs, water, vegetable oil, Maseca, and pink cake mix flour. Mix until smooth. Add in fresh cherries (or berry of your choice), and mix to combine. Use a heaping 1/8 cup of batter and fill each space in donut pan. Remove from pan and allow to cool completely on cooling rack. In a bowl whisk powdered sugar and half and half together until smooth. Color with pink food coloring. Mix until the color desired is reached. 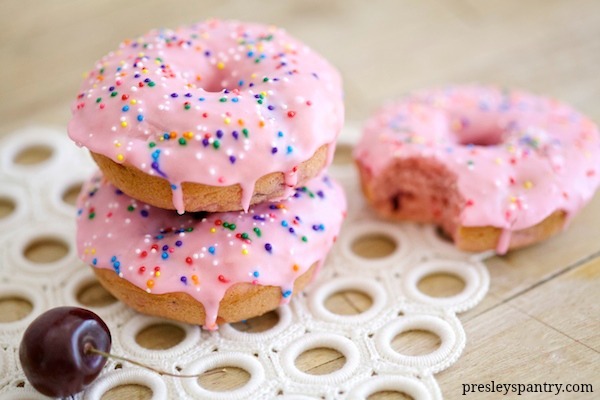 Dip one side of each donut into the pink frosting then place back on cooling rack to dry. Sprinkle the top with candy sprinkles and allow frosting to set for about 2 hours before eating. Disclosure: This post is sponsored by Maseca. However, the recipe and opinions are my own.